Arkansas duck hunting and goose hunting is a wonderful experience, steeped in rich traditions. Hunters find some of the worlds best public duck hunting opportunities in Arkansas. There is the National Wildlife Refuges and Arkansas Game & Fish Commission Wildlife Management Areas for hunters that prefer going on their own or for other hunters who wants an experience of Arkansas duck hunting, there are many excellent waterfowl guide services available. Some of these Arkansas guide services are located in places such as Walnut Ridge, Brinkley, Little Rock, Stuttgart, and Dewitt. Many of these guide services, which are found in the heart of the flyway, provide hunters with extraordinary meals, comfortable lodging, and personalized service. A typical day using guide services, often starts in the early AM hours, where you have coffee and a continental breakfast. Duck hunting guides discuss the days duck hunt. They also do a gear check with the hunters. Then they transport the hunting party to the site, where they normally hunt until around noon depending upon the hunting conditions and weather. Many guide services also offer PM hunting for interested duck hunters. Finding a reputable guide is extremely important when duck hunting in Arkansas. You certainly do not want to become a hunter that spent a lot of money for a very bad duck hunt. Before booking your Arkansas duck hunting packages, do your homework. Good tour guides are worth the money because they know all the best private and public areas. Without a duck hunting guide when going hunting, you could end up lost or have no idea where to go. Look for a duck hunting guide service that is established, speak to the owner, ask for references, and talk to other duck hunters. Make sure they can provide you with the services you are looking for when searching for affordable arkansas duck hunts. The best time for guided duck hunts in Arkansas is typically anywhere from mid December to the end of the duck hunting season in January. January is consistently the very best time for ducks and great weather conditions. 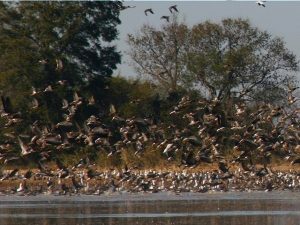 In NE Arkansas, good Arkansas duck hunting normally begins a little earlier in the season than places such as Stuttgart. The Arkansas Game & Fish Commission can provide hunters who wish to go on guided Arkansas duck hunts with up-to-date rules and regulations. In Arkansas, all migratory bird hunters over sixteen must register with the Harvest Information Program. The daily bag limit in one calendar day is one duck. They allow hunting only during the open shooting hours. It is your responsibility to know the laws when Arkansas duck hunting.